It’s a life most girls would kill for: a gorgeous house with a pool, an aunt who wants to take you to the salon and buy you a whole new wardrobe, a built-in set of popular friends ... who wouldn’t want that? Emily Curtis, that’s who. After Emily’s mom died of cancer a year ago the medical bills put her dad’s garage out of business and both of them out of their house. They’re moving in with Dad’s sister and her family in their luxurious home in another city, miles away from everything and everyone Emily holds dear. On paper, it should be fabulous. There’s plenty of room for Emily and her dad, the family is warm and welcoming, and Emily’s cousin Whitney is almost exactly her same age. That would be perfect Whitney, the golden child. She’s a cheerleader (of course), beautiful fashionista (of course), on the honor roll (naturally). Emily is more of a ‘grease under her fingernails’ kind of girl. Her wild, curly hair doesn’t take to styling, she doesn’t like to shop, and her grades are spectacularly adequate. Any minute now she’ll find herself sentenced to Aunt Darlene’s Boot Camp for Beauty Delinquents. Emily’s boxes of car manuals are never going to fit into the décor of her pretty peach room. Yes, car manuals. Emily’s a grease monkey, never happier than when she has her head stuck under the hood of a car. Her perfectly manicured aunt doesn’t have a clue what to do with a tomboy like Emily. There is a bright spot—his name is Zander and he lives next door. Even better, he’s restoring a 1970 Dodge Challenger. Hmmmm, cute boy with a garage full of auto tools and an engine that needs rebuilding, just across the driveway ... he’s probably out of her league. Either that, or a gift from God. Speaking of God, Whitney seems to get along with him just fine. So does Zander. But God and Emily aren’t exactly on what you’d call speaking terms. After all, he let her mom die. Ever since, Emily’s had trouble talking to him. She figures he’s abandoned her—but before it’s all over, she might just find out he was taking care of her all along. This is Amy Clipston’s first young adult novel, but she’s a seasoned author with a best-selling Amish fiction series for adults to her credit. That experience shows in this charming story that tackles serious issues in an engaging and realistic way. Loss, grief, family dynamics, finding your way in a new life, the angst of just being a teen ... they’re all here. Emily’s struggle to stay true to herself—when everyone around her thinks she should be someone else—is a story readers of all ages can identify with. The ending is just right, too—satisfying without having every loose end tied in a neat little bow. 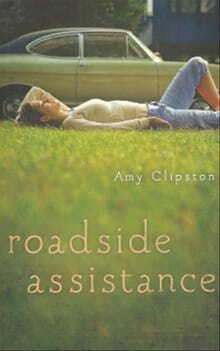 No need to call a tow truck for this novel; Roadside Assistance hums along like a well-oiled machine.